The opening ceremony for the Bishops Palace VAD Hospital in September 1918. Voluntary Aid Detachment hospitals were run by a voluntary unit of civilians providing nursing care for military personnel across the British Empire, particularly during World War I and World War II. Although VAD hospitals were linked to war efforts, they were not military hospitals as such because they were not under the control of the military. 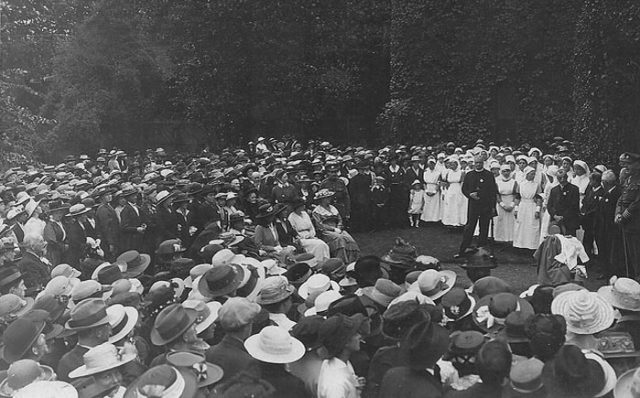 VAD nurses worked in both field hospitals close to the battlefield and longer-term places of recuperation back home. The Bishops Palace hospital, also known as the Palace Auxiliary Hospital, had 50 beds and was situated inside the palace of the Bishop of Peterborough within the cathedral precincts.